It got cold enough to need mittens here in Northern California. Imagine THAT! And we did not have any. So in no time flat, I made some from a beautiful felted Merino wool sweater. 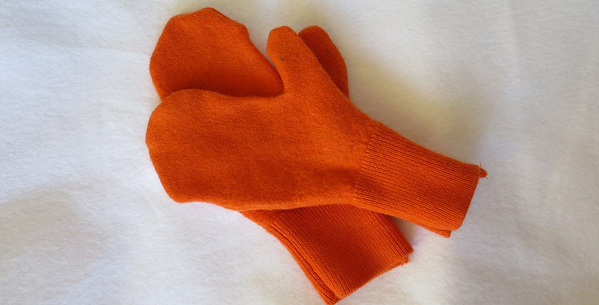 You can do these mittens too. In less than an hour. felted material (a sweater, or fleece…) The sweater I used was a felted merino wool sweater. I purchased it for pennies at a thrift store. It was already felted. (I am SO proud that I did not felt this sweater in a tragic accident.) The tag in the sweater reads XXL, so that is the section where it was hanging, but always have a look. It was never going to sell in off the rack because the sweater was actually super small. 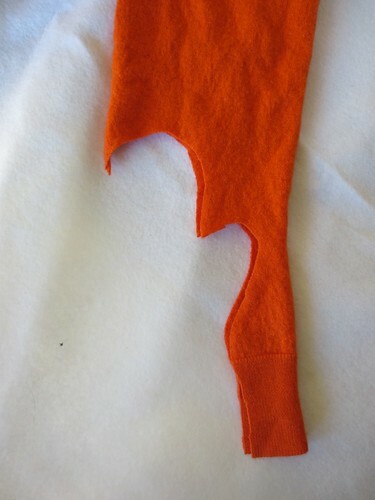 For my small model, I could cut the mitten out of the sleeve. So I got the perfect amount of cuff on each mit. 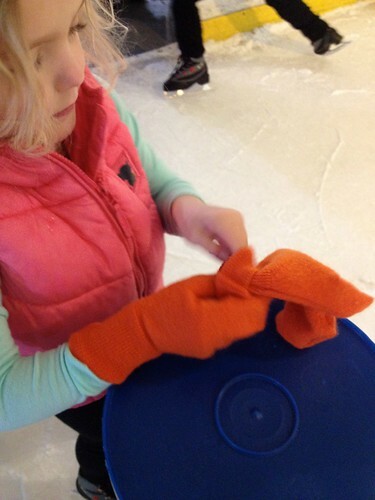 Press the mittens lightly to help smooth out the rounded corners. 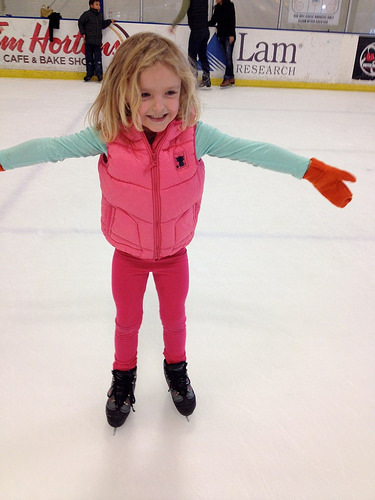 Go ice skating and wear the mittens! 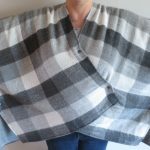 5 years ago by Susi in Needlecraft , Projects , Sewing , Sewing Projects | You can follow any responses to this entry through the RSS feed. You can leave a response, or trackback from your own site. Keep warm! Great job on the mits. I love that color orange! 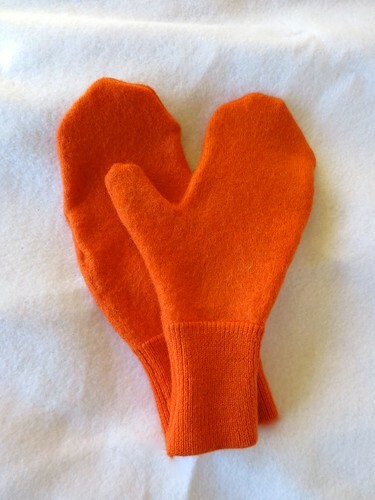 Super cute mitts! Great color. So much fun to skate. Lived at the 10 Street rink for years, when my boys played hockey. Every city we visited out came the skates back when they were small. Fun times. Hope your skating with her. Thank you for this post. I recently bought a beautiful “felted” hand embroidered sweater set at a thrift store & I had no idea what I was going to do with it (it was so gorgeous I knew I’d find something). 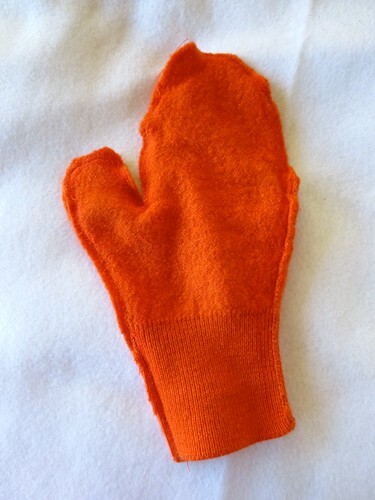 Now, I know, I’m going to make myself a pair of beautiful mittens. 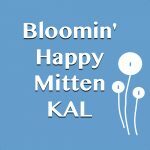 I have a couple of other plain felted sweaters that I’ve picked up at thrift stores as well so I’ll be busy making mittens from them also. That is amazing. Hmmmm. I think there is a project in there!!!!! 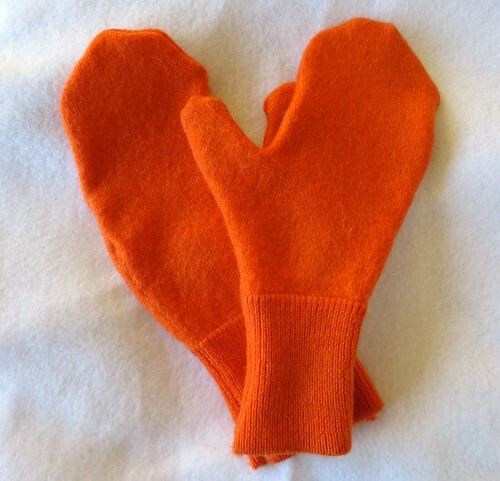 I just had a thought, the mittens I make out of the plain felted sweaters would be good liners for my husband’s mittens that he uses when shoveling in -23F Minnesota weather.